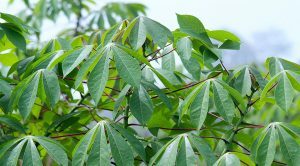 The International Institute of Tropical Agriculture (IITA) was recently granted a permit to carry out Confined Field Trials (CFT) on genetically modified cassava (AMY3 RNAi Transgenic lines). This research, carried out in collaboration with ETHZ Plant Biotechnology Lab in Zurich, aims to reduce starch breakdown in storage roots of cassava after pruning the shoots, prior to harvest of the crop. The objective is to obtain storage roots with lower postharvest physiological degradation without any loss of the nutritious starch. Cassava (Manihot esculenta Crantz) is an important starchy food crop in sub-Saharan Africa (SSA) as well as other tropical and subtropical regions. However, one of the challenges faced by cassava farmers is the high level of postharvest loss caused by rapid deterioration of the starch-rich roots which occurs naturally after harvesting. Though the postharvest deterioration can be reduced by pruning the shoots of cassava plants without unearthing the roots, this poses a problem as the desirable starch stored in the root can be degraded by the plant after pruning, which in turn lowers the harvest yield and root quality. In order to address this, a research project was conceived at ETH Zurich where cassava plants using cultivar 60444 were generated using RNAi as the tool to try to reduce starch breakdown in the root after pruning of the shoots. Extensive testing was carried out in greenhouses in Switzerland, where the plants were grown for three consecutive years. The CFT permit was issued by the National Biosafety Management Agency in accordance with the National Biosafety Agency Act 2015 and is for the period 22 September 2017 to 31 December 2018. IITA adheres strictly to national and international biosafety standards and will ensure that these are enforced during the trials, which will be carried out within the IITA campus in Ibadan. The research is a fact gathering process to gain fundamental knowledge about starch metabolism in the storage root and about cassava as a crop. The cassava plants from the confined field trial are not destined for the market nor for commercial development and therefore will not be consumed. And according to national regulations, all plants will be destroyed within the CFT site after analysis. As part of the experiment, regrowth of stem cuttings from the plants will also be assessed, since regrowth may also depend on starch stored in the stem. This is important since cassava is normally propagated by stem cuttings and not by seed. The primary beneficiaries of the knowledge gained from this research (and its eventual application for cassava improvement) would be cassava farmers in Nigeria and other regions.